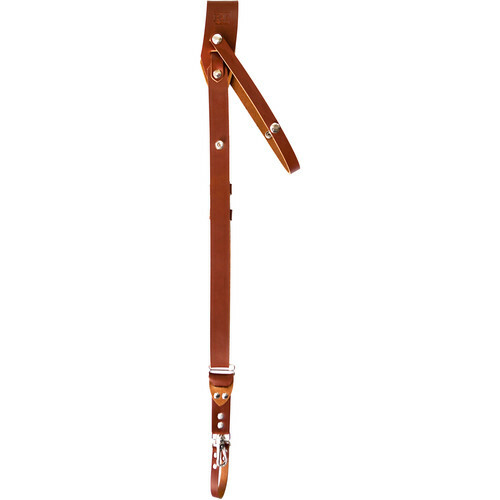 Carry your DSLR or mirrorless camera and attached lens with the handcrafted, made in the USA, small tan Andino Pro Single Leather Camera Sling from RL Handcrafts. Photographers will appreciate the quick-access camera glide system. Genuine leather combined with stitched and waxed edges, and nickel-plated brass hardware ensure strength, looks, and durability. For comfort and stability, the sling has an integrated stabilizer, and button adjustments for a custom fit. A security strap is included. Box Dimensions (LxWxH) 10.7 x 3.5 x 3.5"